Nothing like a cold blizzard to start off my first day of treatment! Today was my first day of proton therapy at Massachusetts General Hospital’s Burr Proton Center, the first place in the world to perform proton therapy on patients. It started at Harvard, and was later moved to MGH…but needless to say, they are the experts! There are actually only about 14 centers in the United States, and 14 internationally. For the next 6 weeks I’ll be going to this center 5 days a week for treatment. The good news is that each session lasts only about 20-30 minutes (…which consists of mostly just preparation time). Last night I started taking the oral chemotherapy called Temozolomide (…Temodar for short), along with a whole host of other medications for nausea, possible infections, etc. It was a little nerve-racking receiving the medication in a biohazard bag, but I went ahead and took my first of what will be many doses of chemo. (…for any of the Luce family reading this, I watched your video immediately after taking the chemo, and had a great night sleep). I will be taking a low dose of the temodar 7 days a week while I undergo radiation because it helps sensitize the brain tissue, increasing the effectiveness of the proton therapy. After the proton therapy, I’ll begin a higher dose chemo regiment for a longer amount of time. This morning I walked into the center joined by both of my parents. Normally I’ll go in for treatment on my own since it is so easy, but I wanted my parents to see the process. Having them there also helped reduce some of the first time jitters I was feeling. No, its not a muzzle to prevent me from talking…the head-gear locks into the machine and keeps my head completely still. The proton beam therapy has to be very accurate, so the most important thing is to not move. The above photo was taken two weeks ago during a preparation appointment to make the head-gear. The mouthpiece is a mold of my upper jaw, similar to what you get at the dentist. The back padding was molded specifically to my head, and the straps keep it nice and snug. It doesn’t hurt at all, but just feels like a lot of pressure. The gear does make it difficult to speak, but I have 6 weeks to perfect the proton head-gear language. It is pretty sci-fi looking…right? 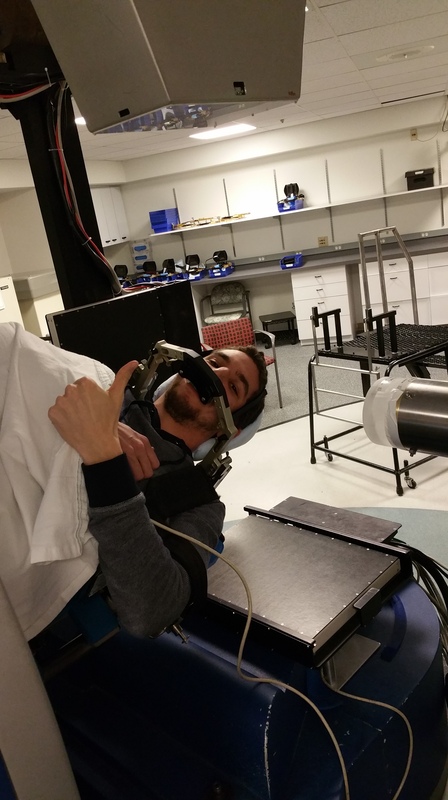 You can see the head-gear is locked into the machine, and I am strapped to the table so I don’t fall off…hopefully. You may have noticed I’m at an angle. Don’t worry…I didn’t get onto the table like that. The proton center has three machines. In two of them, the patient lays flat, and the proton beam arm moves around the patient. Those machines are normally used for kids, elderly, or people who can’t move very well. Since I am relatively young, fit, and good-looking (…those are my doctor’s words, not mine…well with some of my own embellishment), I get to enjoy the “fun” machine. On this machine, the proton beam arm stays still while I move around the arm. Essentially, I get to ride an amusement park ride every day for the next 6 weeks. The black square behind my head is for the x-ray. Once I was strapped into the machine, the techs take x-rays to line up my head in the right position. You might ask…how do they know what the right position is? Well…that’s the fun part. On the same day I had my head-gear made, I had three tiny beads drilled into my skull. Don’t worry…it didn’t hurt at all. I have two beads at each corner of my forehead, and one towards the back, left side of my head. This creates a triangle so that the techs can triangulate the correct position using the x-rays. I’ll have the beads for life, and thankfully they aren’t magnetic…but I sure do hope they aren’t actually tracking devices or brainwashing technology (…if you do notice a drastic change in my personality, or zombie-like tendencies, then just blame the beads). It is actually really neat technology though. When I had the beads implanted, they took a CT of my head. Using the position of the beads in relation to my tumor, my doctor and a physicist calculated the exact angles I will need for the proton therapy. The techs triangulate my head, and the machine does the rest with the pre-programed angles. The arm on the right is where the proton beams come from. The arm comes out of the wall, and is connected to the cyclotron (a.k.a. the big fancy particle accelerator machine that produces the protons). There is only one cyclotron, so the techs all in one remote-controlled room take turns using the machine to deliver the proton beams. What is so special about proton beam therapy, and why am I strapping myself into the machine to do this? An atom’s nucleus consists of protons and neutrons. The protons have a positive charge. When focused into a beam, these charged particles can damage the DNA of cells, and since cancerous cells characteristically divide faster than normal cells, cancerous cells are more vulnerable to the proton beams. Protons also have a relatively large mass, so when they hit another mass (i.e. the skull, brain, tumor, etc.) they tend to stay along the aimed path, rather than scattering in different directions. This is good because it reduces the impact on healthy tissue near the tumor. In addition, the distance the protons travel can be controlled because all protons have a specific range they will travel based on the initial energy. The doctors and physcists can thus program the proton energy and angles so that the protons enter my head, impact the tumor, and stop before going further into healthy brain tissue. This is why I am able to avoid the cognitive side-effects because the proton beam stops before entering the front part of my brain that controls cognition. You can see from the above diagram that the proton beams can be programmed to die off at the specific distance where the tumor is located…PRETTY COOL! After the first position, I was turned almost 90 degrees to my right side. The techs said that the positions will always be different…so it won’t always be this fun…oh well. After a total of about 30 minutes, (including set-up), I was in and out of my first proton therapy. Jeremy, thanks for sharing, in such detail, your journey. Your courage is remarkable and your positive energy, I’m sure, will play a big part in your healing! You truly are an inspiration. Next PostNext 11 Years Later…What’s Changed…What Hasn’t? Please support Brain Tumor Research!